Most people spend more time and money on their cars than on taking care of their brains. With a little teaching or coaching, it’s amazing how you can boost the performance of your brain. 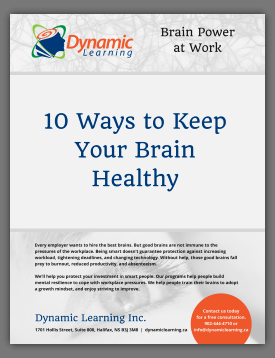 For decades Dynamic Learning has been offering well-researched, practical techniques which clients apply immediately to increase productivity and enhance their work environment. Customized in-house training programs help you motivate, develop, and focus your people. You hire the best brains. We help them work better! Mindset determines the nature of our response to our experiences. Individuals with a growth mindset are more adaptive and resilient. They are on a continuous path of learning, growth and improvement. Isn’t that the type of employee you want to develop in your organization? Our brain-focused approach helps your executives and managers become more engaged, more collaborative, and more flexible - leading to steady improvement. Find out more. Learn how to develop a culture that supports growth mindsets which result in an overall smarter and more resilient workforce. Find out more. Eileen Pease motivates people to explore their full potential, become more resilient, and get more power from their brains. Find out more.